Last weekend, Ronjie brought me to Tiendesitas (my first time there... loved the pet stores!) 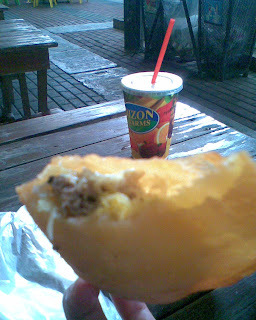 and introduced me to Vigan empanada. Mmm... I liked it. 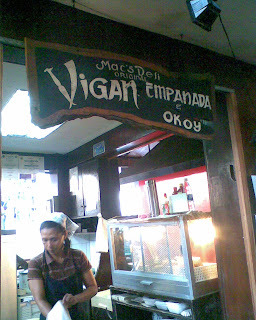 :) Different from the usual (Red Ribbon) empanada I was used to. 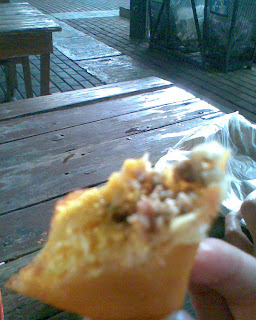 Vigan empanada had a filling of grated papaya + ground meat + a whole egg! 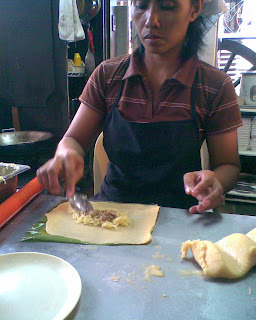 The experience was even more enjoyable because I got to watch how the empanadas were made, from 3 feet away! Fun! "When you fall in love, it is a temporary madness. It erupts like an earthquake, and then it subsides. And when it subsides, you have to make a decision. You have to work out whether your roots have become so entwined together that it is inconceivable that you should ever part. Because this is what love is. Love is not breathlessness, it is not excitement, it is not the desire to mate every second of the day. It is not lying awake at night imagining that he is kissing every part of your body. No… don’t blush. I am telling you some truths. For that is just being in love; which any of us can convince ourselves we are. Love itself is what is left over, when being in love has burned away." Who's read the book na?